Straw plaiting, or creating the long lengths of plaited straw that would later be made into hats, was centred around Bedfordshire and Buckinghamshire, and Wing is one village where many women and children were employed in the industry. Straw hats were the most popular headgear of the 19th century, being light to wear and keeping out both sun and rain – very practical for rural folk. The straw was also used to make fashionable bonnets that were sent throughout England, Europe and to America. The straw plaiter’s raw material was straw (preferably rye or wheat), often but not always locally grown, cut into 9 or 10 inch lengths, fumigated and bleached using sulphur fumes, and, particularly in the later 19th century, dyed. While the whole lengths could be plaited as they were, it was more common to split the straw lengthwise which provided thinner lengths that had both a shiny and dull side. This, combined with the increasing variety of patterns, enabled more exotic lengths of finished plait to be made. While the women were free to work at plaiting in their own time, they were effectively in the employment of the plait dealers. These local men (or sometimes women) would advise what patterns, colours and sizes of plait they were after, and purchase the finished hanks of plait from the plaiters – these would then go to the bonnet makers. Of course it was in a plaiter’s best interests to be able to produce a variety of patterns to the required standard, or changing fashions could see them lose their source of income. The work of a straw plaiter wasn’t much fun. The work itself must have been very repetitive, numbing to both mind and fingers. The straw was brittle and needed to be moistened as it was worked – saliva was the best way to get this done but did lead to very chapped lips. A straw plaiter’s fingers were inevitably roughened by the work, not to mention the carcinogenic effects on the body of the bleaching and dying methods used. And young unmarried women strawplaiting from their rural homes rather than being away in service contributed to overcrowding, which led to all sorts of health problems. However the work did have its benefits – women could work at home while keeping an eye on the children, or in groups of friends, and it was even possible to plait while wandering around the village chatting to neighbours (or men friends….yes, some plait girls apparently did have a reputation!) 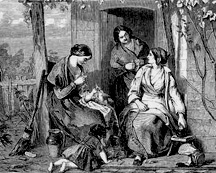 It was also a source of income in a time when these were few and far between for women – and children. In some villages including Wing “plait schools” operated where children of all ages would work a full day, with minimal time spent learning to read. It was also not uncommon for girls to work at home with their mother. The Leighton Linslade Virtual Museum‘s online gallery about strawplaiting has photos of the tools used by the plaiters. Bedford Today‘s website has a portfolio of photos illustrating various aspects of the straw plaiting industry. The Workwoman’s Guide from 1840 (available from Google Books) has a chapter on strawplaiting including instructions on exactly how best to undertake it. While plaiting would have begun in Wing in the 1700s, or perhaps earlier – Tring was only 7 miles away and had a charter mentioning the sale of straw plait as early as 1680 – the first mention I have found so far of the industry is in the occupations of fathers baptising children in Wing from 1813. These men included Matthew GOSS (dealer in straw plait in 1815), Floyd DIMOCK (straw factor in 1819), Edward RANDALL (straw dealer in 1837), and James STEVENS (plait dealer in 1837 and listed in the Robsons directory of 1839). The 1841 census was the first to list individuals by name and occupation. There are 2 straw dealers (Edward RANDLE and Hannah STEVENS), 4 plait dealers (Matthew GOSS, Joseph HARPER and Benjamin and Nathaniel RANDLE) and only 13 straw plaiters. The number of dealers and overall Wing population is comparable to the 1851 census, which suggests the plaiters themselves are significantly under-recorded in 1841. It appears that only those unmarried women supporting themselves (and perhaps their elderly parents) through plaiting were recorded as straw plaiters, while married women supplementing the family income, and the child workers, were simply not recorded as such. Baptisms in the 1840s show William WOSTER as a dealer in straw plait (1844), and yet another RANDLE, Frederick, as a straw dealer in 1848. The 1851 census tells us that 19% of children under 10 in Wing were working as straw plaiters, and 36% of adult women were also employed within the straw industry. This census our straw dealers were Jesse JORDAN, Frederic RANDALL and John RANDALL (John gives his occupation as a strawcutter upon the baptism of his son the following year), while the plait dealers were Matthew GOSS and George HEADY. The youngest straw plaiter was 4-year-old William HEADY (son of dealer George so helping out with the family business was to be expected! ), and the oldest was Sarah JORDAN at 62. George HEADY filed for bankruptcy in August 1854, so it would seem that even with the whole family helping out it was difficult to make a living. His occupation then was given as a straw dyer. Another RANDLE, Nathaniel, appears in the parish registers as a plait dealer in 1856. 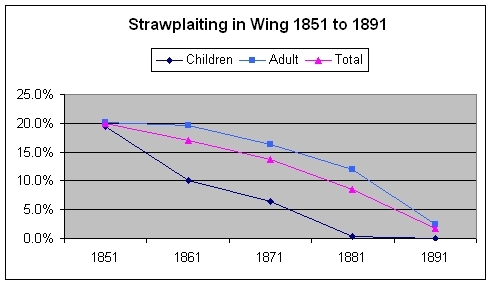 By 1861 the numbers involved in straw plaiting had decreased slightly, while the percentage of children had almost halved. Frederick RANDLE and wife Hannah were the straw dealers this year, while there were no plait dealers listed in the village. The youngest straw plaiter was 2-year-old (!) William ROADNIGHT, and the oldest was 65-year-old Mary CULVERHOUSE. By 1868 the village had a resident plait dealer again – William CHILDS, who had gone by 1871. In the 1871 census there was a noticeable decline in the numbers employed in the straw plait industry from 17.1% to 13.8% of the Wing population (a loss of around 50 people). This decline was also true for children despite the fact that a plait school run by Mrs Eliza WOOLHEAD was operating. The school had been in existence since at least 1867 (and most likely for quite some time before that) when the Workshop Regulation Act was passed that year, as the Wing magistrate wrote to the Home Office for a ruling as to whether attendance at a plait school counted as employment, which was forbidden for children under that Act. The official word was no, it didn’t, so the school continued on. That said, it seems that position changed quickly as in 1868 Leah TAYLOR was charged with having employed two girls under the age of eight at her plait school when the inspector of factories visited on 14th March. Vicar Peter Thomas Ouvry, in his role as magistrate at the petty sessions, discharged her with a caution and indicated that she had been charged only to bring attention to the Act as it applied to plait schools. Rev. Ouvry had also written to the papers suggesting the law should “punish parents who send their children into infected houses, and houseowners who receive children when an infectious disease is in the house”1 – in 1870 scarlet fever was prevalent in Wing and the medical officer had found one suffering child lying in the corner of a room full of plaiting schoolchildren, and 20 other children had already died by the time of this visit. The overall decrease in numbers plaiting in Wing from 1861 to 1871 primarily reflects the negative impact on employment that the importation of cheap plait from the Far East and Italy was having – in fact there was a plait importer living as close as Linslade by this time. The ages of those still involved in plaiting in Wing ranged from 4 to 73. Frederick RANDALL was still operating as a straw dealer, as was his uncle Nathaniel (the two men were very close in age although technically a generation apart). Other strawdealers in Wing this year were Robert BOARDER, George GREEN and Jane PEAS. By 1876 the Elementary Education Act was in full force. This meant that no children under 10 could be in employment, and those aged 10 to 12 could be employed only if they had a certificate of attainment from the local school inspector – more stringent requirements than those in the ineffective Workshop Regulation Act. As a consequence, the 1881 census shows that there were very few Wing youngsters plaiting – however they include two DICKENS sisters aged 7 and 5. The overall proportion involved in straw plaiting dropped dramatically to just over half the number a decade before. This trend continued with the 1891 census when the percentage of employed in the industry falls to only 1.8%. There were 33 strawplaiters, all females, with ages ranging from 11 to 61, while two teenage GREEN sisters were apprentice milliners. No-one was recorded as a dealer in either straw or plait. Finally, by 1901 the industry in Wing consisted of just three people, plait dealer John OAKLEY and two plaiters, Sarah ROWE and Matilda BANDY (two middle-aged sisters living with their elderly widowed mother, perhaps falling back on their only marketable skill to make ends meet). You may note that the family perhaps most closely associated with plaiting in Wing were the RANDALLs, with three generations of men operating as straw dealers or plait dealers. Edward was still listed (in his 80s!) as a straw dealer in 1841. Three of his sons, Benjamin, John and Nathaniel, all worked as dealers for at least part of their lives. Benjamin certainly did very well at it, having made sufficient money to invest in several properties throughout Wing and live off the rents, while passing the business on to one of his sons Frederic. Do you have stories or photos about your Wing strawplaiters? Email me to share them.